Toward the end of 2011, Viaje released their third release in their “Holiday Blend” series. Back in 2009, the first Viaje Holiday Blend was released, and I considered a very good cigar experience. 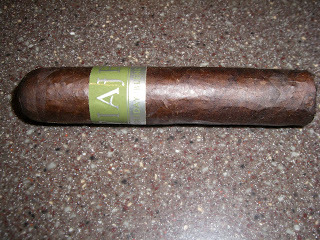 Fast forward to 2010, and I was looking forward to the Viaje Holiday Blend 2010. Unfortunately, the experiences with the 2010 version of that cigar were not positive. Therefore, when the Viaje Holiday Blend 2011 hit the shelves, I will admit, my anticipation for this cigar was not what it was a little over a year ago. The great news is after smoking the 2011 version of this cigar, I’m pleased to report that this version has proven to be the best release of the Holiday Blend Series. If you have read several of our Viaje rules, you know that many times, I have recommended aging Viaje cigars a minimal of 8 to 10 weeks after these have shipped. Last year, I followed this rule with the Viaje Holiday Blend 2010 – and aged it 5 months in my humidor before smoking any of the blends. Overall, I just felt something was missing in that blend – and it resulted in a very boring smoking experience. With the Viaje Holiday Blend 2011, I aged it for about 11 weeks. I did not smoke a blend prior to the 11 weeks of additional aging, but there were some preliminary reports from others I know that the Holiday Blend 2011 needed some more age out of the box. As with most Viaje releases, the Holiday Blend 2011 was released in small batches. In these cases, this usually means each authorized Viaje retailer gets one to two boxes of each size. How did the Viaje Holiday Blend 2011 help bring this particular Viaje line back to life in my book? Let’s take a closer look. There were no specific details about whether the blend has changed from previous years. The one thing to consider though is that this could be another crop of tobacco, and that can factor into the end result of the cigar. This year, Viaje makes a change to the sizes for the Holiday Blend vitolas from 2010. The Viaje Holiday Blend 2011 still features the same vitolas, but each is increased 1/4 in length. For this cigar experience, I opted to go with the Petit Robusto. The cigar is a well-packed cigar with no soft spots. Like its predecessors, the Viaje Holiday Blend 2011 is highlighted by its dark, roasted coffee colored wrapper. From close examination of the wrapper, there are some additional dark(er) spots on the wrapper. The wrapper itself is oily. It has some visible veins. While the wrapper is primarily smooth, there are some areas where the wrapper is toothy. The cigar also features a covered foot. You can detect a farm-like scent from this cigar. 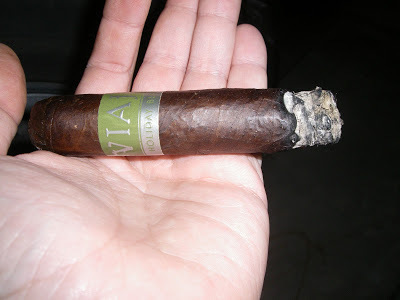 The band is the same as the previous Viaje Holiday Blend ones – olive green and silver in color. It features “Viaje” in large classic silver font on an olive background. Below that text is the text “Holiday Blend” in olive font on a silver background. That silver background is situated below the olive background on the band. For my Viaje Holiday Blend 2011 Petit Robusto, I placed a straight cut into the cap and commenced with the pre-light draw. The dry draw notes were primarily coffee ones, but I could also detect hints of cherry and cedar in the background. Overall, I considered this a positive pre-light experience and one that was much better than the Holiday Blend 2010. At this point, it was on to toast the foot of the Holiday Blend 2011 and see what this cigar would bring to the table. The start of the Viaje Holiday Blend 2011 was already more exciting than the 2010 version. The start treated me to notes of pepper, roasted coffee, cherry, and some wood. The pepper was not a classic black pepper and seemed to be some pepper variant that I really could not come up with an analogy for. Early on, the cherry notes became the primary flavors, the pepper notes took a secondary role, while the roasted coffee and wood were tertiary notes. The cherry, pepper, and coffee notes then took turns alternating as to which note is in the forefront. By about the ten percent point of the Viaje Holiday Blend 2011, the coffee notes morphed more into a chocolate/mocha flavor. The alternating of the flavors continued for most of the first two thirds of the smoking experience. The interesting thing is how the chocolate/mocha, pepper, and cherry notes had a great synergy, yet at the same time could be easily identified individually. This flavor profile would hold for the first two thirds. In the last third, the cherry sweetness diminished, and it was the pepper and chocolate notes that remained. I was expecting the Holiday Blend 2011 to finish very spicy, but this didn’t become the case. The chocolate notes complemented the pepper right until the end. The finish was actually smoother than I also expected. 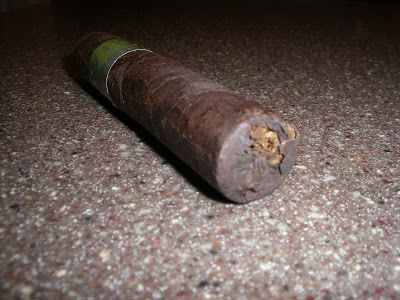 The resulting nub was outstanding – cool in temperature and firm to the touch. Overall, the flavor profile seemed developed and age was not an issue here. For the construction attributes of burn and draw, I felt the Viaje Holiday Blend 2011 scored well, but just didn’t deliver perfect scores. For the burn, while the cigar didn’t canoe, it didn’t have a razor-sharp burn like I would like – despite multiple touch-ups. The burn line remained jagged for much of the cigar experience. The burn rate and burn temperature were ideal. The resulting ash was salt and pepper-like. For the Viaje Holiday Blend 2011, I actually felt it had more strength than the Holiday Blend 2010. I felt the 2011 had just enough strength to qualify it as a full-strength cigar. The flavors to the Holiday Blend 2011 were much more robust and developed than the 2010. In my book, I assessed the Holiday Blend 2011 to be full-bodied. There is a good balance between the strength and body to this cigar – providing the best of both of power and deep flavor have to offer. Sometimes a blend doesn’t work and sometimes a crop of tobacco doesn’t do it. My less than stellar experience with the 2010 Holiday Blend could be indicative of that statement. The good news is that things really picked up with the 2011 Holiday Blend. The Viaje Holiday Blend 2011 not only brought this blend back to where it was when it was first released in 2009, it took it to new heights. A notch higher in burn or draw scores and this could be contending with the top cigars of the year. This is a cigar that will satisfy many Viaje fans as well as experienced cigar enthusiasts. This might be a little too-much cigar for the novice. As for myself, I consider this a box-worthy purchase. Great review–matches my experience almost exactly. I was lucky enough to find both sizes in a nearby store I hadn't visited in a while due to their poor selection. Great find!